The Werratal region was heaven for cycling on our 'Green Belt' bike tour. We could cycle along the river most of the time and passed many other cyclists. Everytime we got a friendly smile and hello. 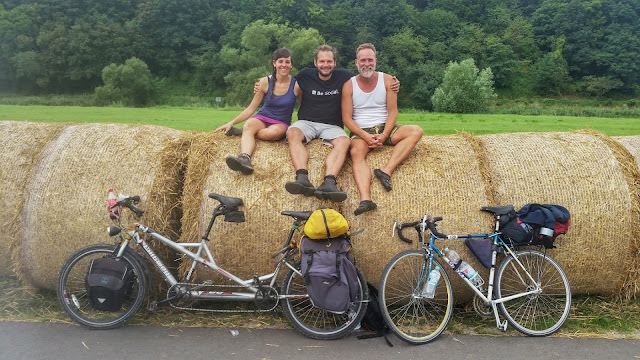 Tandem buddies on this part of our 1000 km 'Green Belt' bike tour also known as 'Das Grune Band' were Volker and Lorene. We visited Witzenhausen, Bad Sooden Allendorf and Eschwege and tackled some Destination Challenges. We paid a visit to Grenzmuseum Schifflersgrund which left quite the impression on us. Have you ever been to this region in Germany? If you have then don't hesitate to share your favorite pictures from your trip with us in the comments. Thank youuuuu!